The IBEROSTAR Paraiso Lindo is a luxurious and elegant hotel on the Riviera Maya. Located right on the beach between Cancun and Playa del Carmen, this 5-star All-Inclusive resort has amazingly beautiful traditional architecture in a rich natural environment. The best entertainment services and an exquisite gastronomy make it the best choice for an unforgettable vacation. Colonial style decor. The IBEROSTAR Paraiso Lindo hotel will leave you speechless from the first moment you step into its lobby, which resembles an ancient monastery with touches of gold leaf. The resort is decorated in traditional colonial style down to the smallest details, from its beautiful patios, its stoned paths to the room lamps that decorate the yellow walls. Irresistible Gastronomy. This All-Inclusive hotel offers exquisite dishes in its a la carte restaurants and huge international buffet. Its varied gastronomy offers hundreds of flavors and textures. Vol-au-vent stuffed with shrimp and lobster cream or beef medallions and chicken rolls with almonds are just some examples that will delight even the most discriminating palates. Excellent facilities for children and families. The IBEROSTAR Paraiso Lindo hotel is designed to entertain the whole family. Adults can enjoy a cocktail at any of the hotel bars and clubs, while teens have fun with nightly live entertainment. And for children and teens, the Kid’s Club and Teenie Club becomes a place where fun is guaranteed. Pricing on all resorts can be attained by clicking the drop down menu from the booking page. Iberostar Paraiso Grand – Adults only can book at the Iberostar Paraiso Grand, a 5 star true beachfront luxury resort. Dine on lobster and steak with no surcharge. You also get exchange privileges with all four resorts in the adjacent Iberostar Paraiso complex with a huge lazy river and even a wave pool. This resort is great for couples because every room is a suite with a Jacuzzi for two, and comes with butler service and 24 hour room service. 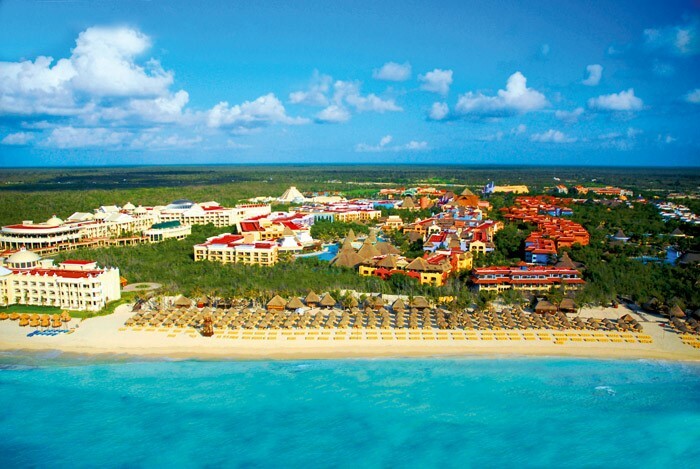 This Iberostar Resort is most definitely the most luxurious all inclusive resort in the Riviera Maya and Cancun area. We highly recommend this resort also for all inclusive couples. We have a suite for you! Iberostar Paraiso Maya – The rooms at this resort are a little larger. Guests needing elevators will need to book at this resort as the Lindo has no elevators. The Iberostar Paraiso Maya offers all inclusive Riviera Maya Honeymoon, vacation and wedding packages. Inspired by the Mayan culture, this hotel forms a complex with the neighboring Iberostar Paraiso Lindo. It features 24-hour all-inclusive service and personalized concierge service during the day. The hotel has a total of five pools, among them a lazy river and a unique wave pool. It also offers five bars/lounges, an ice cream parlor, a game room and a fitness center. In order for everything to be perfect, accessible and elegant, the 446 rooms of the quality IBEROSTAR Paraíso Lindo hotel have been designed so that the elements, decor and details create a warm and welcoming ambience. Therefore, those staying at the IBEROSTAR Paraíso Lindo hotel will find everything they need to make the hotel their second home. 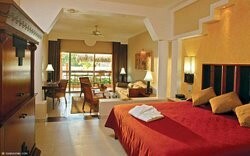 The IBEROSTAR Paraíso Lindo hotel, in the breathtaking Riviera Maya, presents this cozy 484 sq. ft. well equipped guestroom. It features 2 double beds or 1 king bed and a gorgeous private balcony with garden views. There are 5 handicap suites available in this room category to accommodate travelers with disabilities. The Standard Room boasts a vast array of comforts and amenities. From 24-hour room service, digital safe, flat-screen TV, alarm clock, air conditioning and ceiling fan, minibar, and coffee maker, to iron and ironing board, guests will find everything they need. Bathroom amenities include vanity sink, shower/tub combo, bathrobes, and hair dryer. The 484 sq. ft. Priority Location Standard Room features 2 double beds or 1 king bed, and a private balcony with garden view. Also, this guestroom is conveniently located close to the beach and pool. The suite is conveniently situated close to the beach and pool. This room features 24-hour room service, digital safe, flat-screen TV, alarm clock, air conditioning and ceiling fan, minibar, coffee maker, iron and ironing board. This guestroom presents first-class bathroom amenities that include vanity sink, shower/tub combo, bathrobes, and hair dryer. 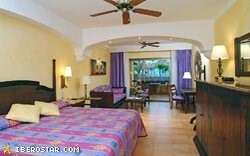 IBEROSTAR Paraíso Lindo hotel in the Caribbean presents the exquisitely furnished Pool View Standard Room. This beautiful 484 sq. ft. suite has 2 double beds or 1 king bed and a private balcony with refreshing pool views. The suite is conveniently situated close to the beach and pool and offers an unobstructed and relaxing view of the hotel’s swimming pool. This beautiful guestroom features amenities such as 24-hour room service, digital safe, flat- screen TV, alarm clock, air conditioning and ceiling fan, minibar, coffee maker, iron and ironing board. Guests can indulge in several bathroom amenities including vanity sink, shower/tub combo, bathrobes, and hair dryer. The fabulous Honeymoon Junior Suite is IBEROSTAR Paraíso Lindo’s special suite for couples. It measures 570 sq. ft. and features1 king bed and a spacious private extended balcony with whirlpool and garden view. Room amenities include comforts such as 24-hour room service, digital safe, flat-screen TV, alarm clock, air conditioning and ceiling fan, minibar, coffee maker, iron and ironing board. The Honeymoon Junior Suite boasts 5-star bathroom amenities such as double vanity sink, shower and separate tub, bathrobes, and hair dryer. Hello my name is Wendi Montoya. I am so excited to be working with Dustin and Brittany on their wonderful Destination Wedding. 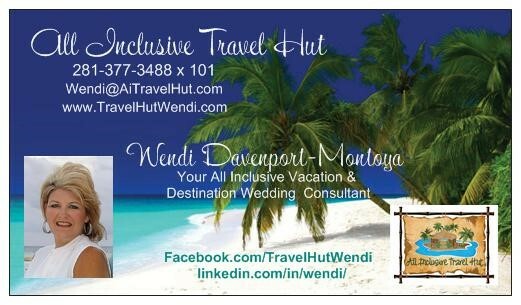 I have had the pleasure of planning Destination Weddings for couples for over 10 years. The couple has chosen the beautiful Iberostar Paraiso Lindo. Please find resort information on this page and use the link listed if you are interested in booking your own room and still get benefits of booking within this group. I look forward to helping all of the guests find the room categories and dates that best fit their travel needs.